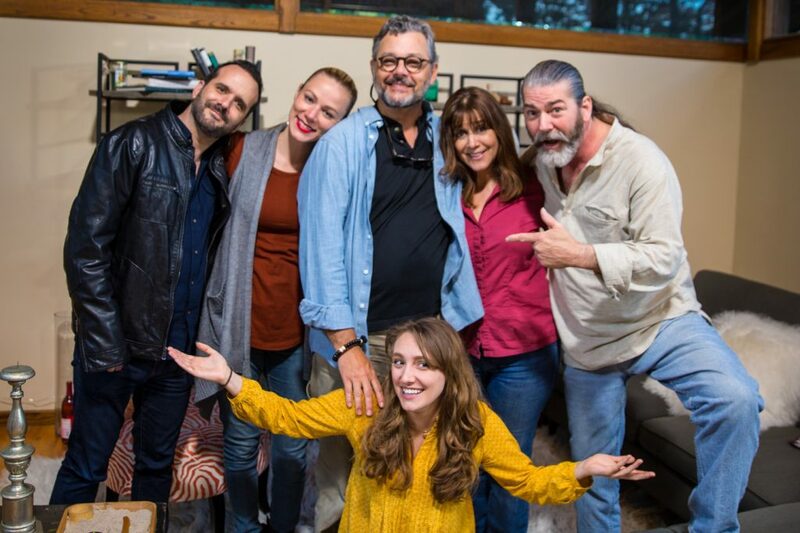 The cast of DEVOURING VENUS, (l-r): Daniel Scot Kaiden (Brian); Kristin Muri (Muriel); Director, Marty Hardin; kneeling, Haley Beauregard (Erin); Maggie Wagner (Janet), and Eric Eastman. Pleasantville, NY – The cast and crew of Devouring Venus drew a collective sigh of relief when today’s final “cut and wrap” were called. There was a good reason: they had completed a feature length motion picture in just 3, industry standard, 10 hour days. A remarkable feat by anyone’s standards. The production began on Monday in a penthouse apartment on New York City’s storied Upper Westside. The film’s director and writer, Marty Hardin worked with the cast. Together they worked through the storylines and the overarching relationships between each of the characters in the story. By the noon on Tuesday, preliminary rehearsals ended. As the cast broke from rehearsal, the crew was making its way to meet at the shooting location in Pleasantville, NY. At 2:00, pre-production and pre-lighting began. By 8:00 pm, the set was ready. At 8:00 am on Wednesday, the crew arrived and work began. And, while this was not a “union shoot”, the cast and crew were given standard industry breaks. The day wrapped at 6:00 pm. That was just in time for the cast members who were commuting to catch a train back to the city. This schedule continued for the next 2 days. “Overall, the film was an experiment in deconstructing the filmic process to reshape production around actor’s performances – rather than having actors conform their performance to traditional production methodology. It involved the fluid use of 5 cameras, a tightly evolved narrative, and improvisation. It brought together theater, documentary, and traditional filmmaking. When I hear the actors speak, they aren’t delivering lines, they’re creating moments. I think it was very successful,” said Hardin. “My producing partners are already calling it the ‘Hardin Method’”, he added with a chuckle. The project began in June with a lunch meeting between Hardin, and one of his co-producers, Jon Russell Cring. They met to discuss possible film concepts. Up until this point, Marty had made over 30 experimental films that had played at over 100 film festivals around the world, but he had always reached a stumbling block when trying to make the leap to a feature film. He contacted Jon. Jon and his producing partner, Tracy Nicole Cring have produced and directed 18 feature films. In the past 12 months, 3 of those films have been released: Hobo Heyseus; The Night We Met, and Darcy (formerly titled This is Nowhere, which they co-produced with Heidi Phillipsen-Meissner). Hardin sought mentorship. As he put it, “I knew what to do, I just didn’t know how to do it. Jon and Tracy have a great reputation for helping people ‘learn the ropes’. I put myself at their mercy. Thankfully they obliged.” At that lunch meeting, Hardin pitched 5 concepts to Jon. They were in complete agreement when they settled on one: Devouring Venus. 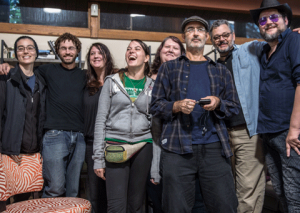 The crew of DEVOURING VENUS, (l-r): Caroline Mariko Stucky (G&E, camera); Bo Smith (G&E,camera); Ashley Gibson (1st AD, Script Supervisor); Tracy Nicole Cring (DP, cinematographer); Craig Slon (sound engineer); Marty Hardin (director), and Jon Russell Cring (assistant to the director). Marty went away and wrote the outline. He emailed the story to Jon and Tracy at the end of June. The second week in July, Jon, Tracy, and Marty were scheduled to shoot on location for 2 weeks on another, unrelated project. In the evenings, Jon and Tracy discussed the difficulties of shooting with Hardin. One evening, Jon said, “Most people talk about about making a film, Marty, are you committed to making this film?” Marty said yes. Thanks to Jon the film had a preliminary cast and a preliminary shooting location within 2 hours. In the days leading up to the shoot, Jon traveled to Florida to visit his brother. His plans were hampered by the hurricane, but pre-production didn’t slow down. Marty and Tracy were often on the phone at 3:00 and 4:00 am ironing out last minute details. In the end, it all came together. The group are working toward May 1st, 2017 as the film’s completion date. Their goal is to have the project ready for the 2017 Cannes Film Market. please send us a message through the Devouring Venus “Contact” page.